I truly love the Create a Critter 2 cartridge!! I came across this super spooky owl and thought it would be perfect to make some goodie bags for my students. The fence was made with a Martha Stewart punch, used a circle punch for the moon, and the Trick or Treat stamp is from a Stampin' up set. Now that Sandy the Hurricane has passed through Maryland it looks like we are back to school and our character stroll and fall party are back on track!! Have a safe and Happy Halloween everyone!!!!!!!! 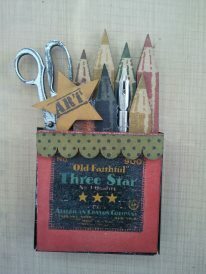 This is part of my project-loved the scissors and crayons!! 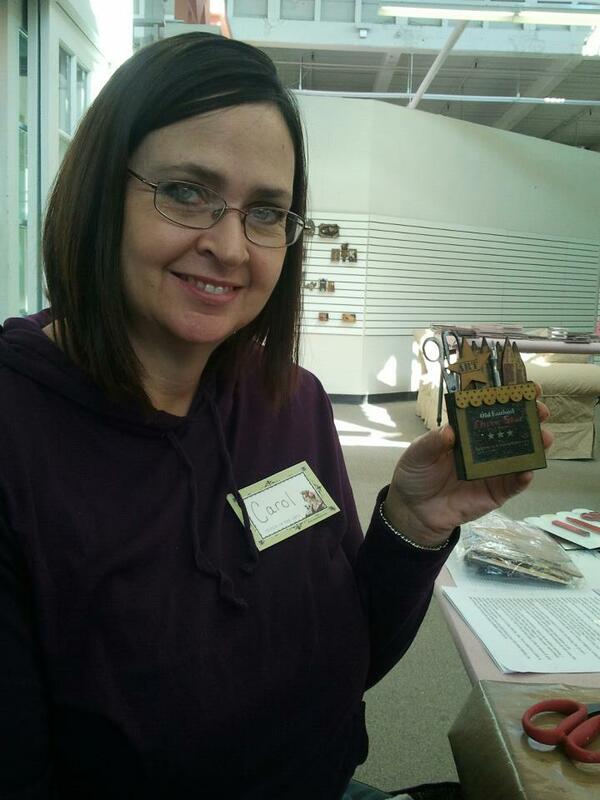 This is Carol with the first part of her project :) Love the green and yellow colors! 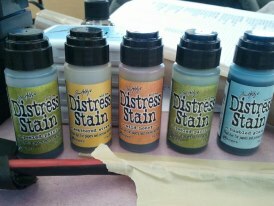 LOOOOOVE the Distress Stains!!!!!!!!!!! Love them so much I just ordered every color!!!! 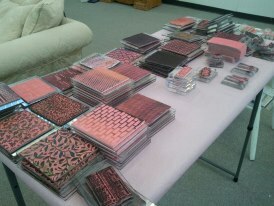 Tools of the trade.......lots and lots of stamps. OOOOOOHHHHH!!!! Some of the other projects, kits, etc. Totally love all of them!!!! I am truly blown away with Patty's creativity for this week's project!!!! She is one talented lady. WOW!! Wouldn't any teacher love to receive these beautiful pieces of jewlery. 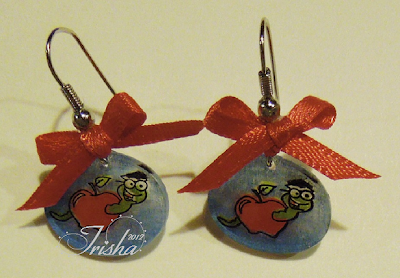 Patty used my new stamp set "Back to School" to create these wonderful pieces. Please check out her blog and leave her a comment about her projects. I am sure she would love to hear the response!!!!! Way to go Patty!! These are truly creative. This is the bridal shower banner that I made to go along with the favors. I used the Pretty Pennants cartridge (which I really love but was a little disappointed that it didn't pre-cut the holes on the banner panels) I used the Storybook cartridge for the words and welded them on the Gypsy, and then I used the Hannah Montana cartridge for the butterflies. I used the "flip" button for the butterfly image on the ends. Spellbinder die cuts were used (Lacey circles and circles) to add some dimension and added Stickles (Diamond) to give it some bling!!! I punched the holes in the banner panels and then added some black ribbon. I really loved how this project turned out!!! Well it is now off to hit some of those Columbus Day sales at Jo Ann Fabrics and Michael's!!!! 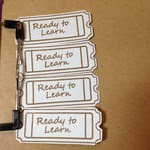 Having more fun creating bookmarks with the "Back to School" stamp set! Check out what the wonderful Design Team members have created this week!!!! They are truly wonderful and I am inspired by their creativity! Blog sites that I love!!! All content included on this site is copyrighted by Wendy Pendarvis. All of my projects and photographs are shared and displayed for your personal enjoyment and creative inspiration. All content on my site may not be used for any type of publication, representation of submissions and/or contests. Please do not claim any of my work, designs, or creations as your own. 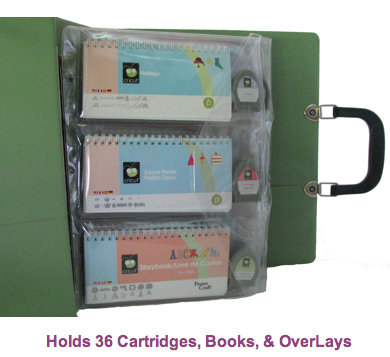 "Cricut" is a trademark of Provo Craft & Novelty, Inc. 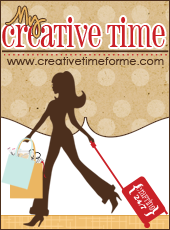 This site is not affiliated with Provo Craft & Novelty, Inc.